Bicycle stems are the components of a bike that connect the handlebars to the steerer tube. Sometimes, you find that some people refer to them as goosenecks. Depending on the design, you may see that the stem’s design belongs to either the quill or a thread less system to the clamps. The stems are meant to add support to the frame of your bike thus avoiding the twisting of metal bars or your bike breaking down to pieces after an accidental collision. Following are some of the bike stems that can be obtained on the market and features which make them an ideal choice for your biking endeavors. If you’re planning on making any modifications to your bike, don’t forget to check out our list of bike repair stands here. This is truly a work of art thanks to the forged AL-6061-T6 aluminum with a 4-bolt faceplate and 2-bolt steerer clamps. It weighs a mere 0.44 pounds and is quite easy to fit onto your bike for that additional protection as well as better control while you are steering through rough terrain. Even when you’re riding gets too dangerous levels such as free riding or going downhill, the stem will prevent the bike from twisting into weird shapes. This way, the bike will be safe even when you are riding in the most extreme conditions and your dexterity will be made more evident when you can perform well under pressure. The bike stem ships with bolts and additional accessories for fitting onto your bike and this means that you have to your avail, every component that is needed to give more support to your bike. On the terrain, your rides will feel effortless in a way that seems to defies gravity. Even with a dangerous stunt to undertake, your handlebars will not twist into strange angles or cause you to lose focus while you’re at it. This assures you of both comfort bicycle and safety while biking so you can try out all the moves you have been dreaming of achieving one day. A strong metal is used in forging this bike stem as the 6061-T6 aluminum holds on perfectly to your mountain bike and gives it the best bike grip to do strange moves without falling down, getting hurt or your bike breaking apart in pieces. The four bolt bar clamp ensures your bar is held securely in position and interlocking U-shaped handlebars for better clump geometry. The faceplate gets rid of stress risers that could cause your bar to bend or break as you take the bike through rough terrain with lots of bumps and unseen obstacles in the way. Additionally, opposing bolts on the tube clamp give you lots of clamping power and at the same time reduces stress on the steering tub. Thus, you are sure of safety while out there riding your mountain bike as well as being able to maneuver about safely. This bike stem has also been designed to fit easily onto any bike and the only installation procedure is tightening the bolts to ensure that the handlebars are well held and secured in their position. With a diameter of 31.8 mm and a weight of 130g, the universal short handlebar stem is ideal for most cheap road bikes. This follows from the fact that it has been constructed of high-strength CNC machined 6061 T6 aluminum alloy. In addition, the stem has an easy installation feature and you simply connect up the original front fork stem. 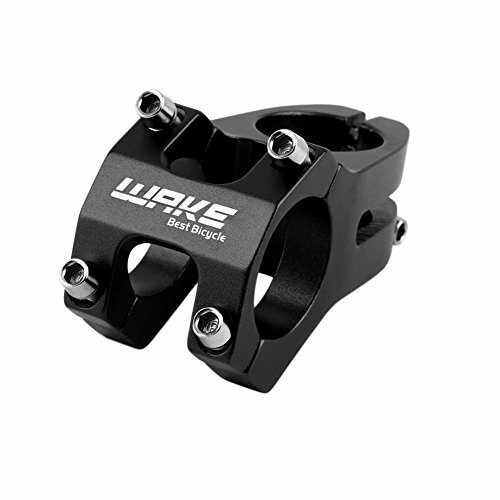 A four bolt bar clamp holds the bar securely in place and makes this stem a suitable option for upgrading your bike, going for downhill escapades or even climbing. Safety is thus assured and you can guarantee the successful execution of your best maneuvers without the bar banding out of shape or be getting twisted into bad shape when you need to move through strange territories with ease. The engineers also considered agility and ease of installation when they were designing this bike stem as it only takes a little while to secure it onto your bike and immediately start to experience the added advantages that derive from this safety feature. High strength features act as a suitable choice for bike stem and whether you are doing an upgrade or a replacement, everything will be intact and this gives you a longer life out of the bike. The races face respond is a part of the new Respond Bike group which aims at improving the experiences of the people who love to ride in the mountains regardless of the weights. 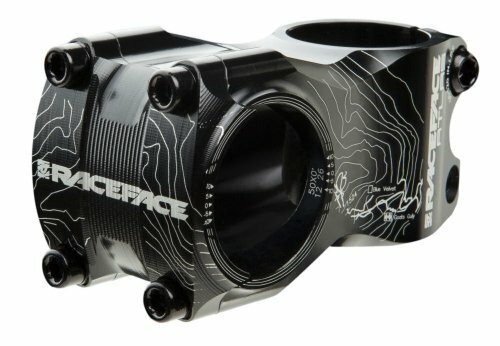 The race face stem has been in the industry for around 15years delivering the best services to the people using them. The stem has a forged and blasted 6061 aluminum which gives you great and excellent strength and prevents you from fatigue and tire regardless of the weight that you hold. The four bolt bar clamp helps you maintain and control the bike in a secure mode of control. 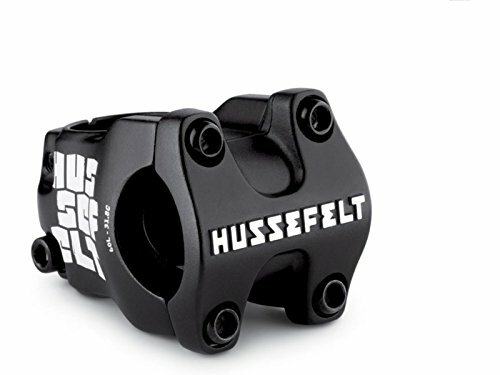 The interlocking U-Shaped handlebar clamp geometry is designed and created in a way that the load is transferred through the stem body and not necessarily to the bolts. To eliminate the occurrence of stress risers, the bike is equipped with a faceplate that prevents the bar from bending or even breaking in the extreme cases. With the ideal race face stem to fit on your bike, it is possible for you to have a great biking and riding experience over an extended period. In most cases, you find that these stems come in black color which means that they can blend in with any bike color and properties. 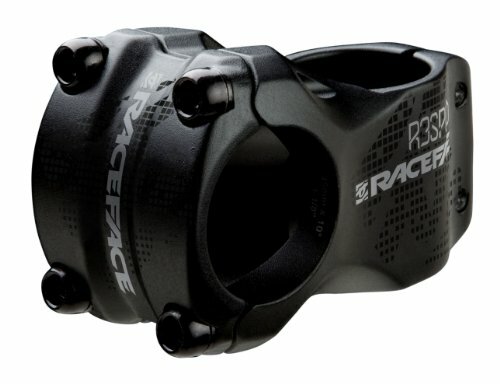 Regardless of the biking environment, you can peacefully ride and enjoy your experience with the race faces respond bike stem. Other features of the bike include; a rise of 100, bar diameter of 31.8mm, stack height of 40mm as well as a weight of around 195g. The Truvativ Stylo Stem prides itself on many features in stems costing twice as much. According to most people, the great Stylo T20 is a very good choice for varied outdoor activities as well as excellent for trail performance. 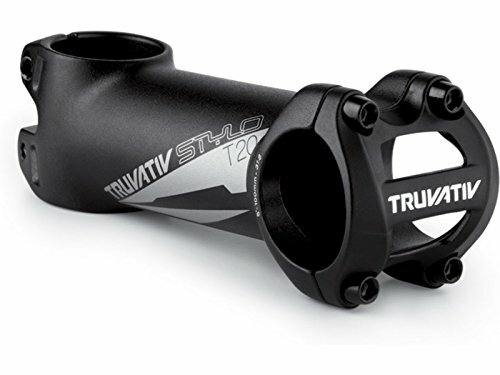 When purchasing the Truvativ Stylo Stem, you realize that it is a little bit distinct and different from the others in that it offers more than the usual entry level cycle stem. The 3D forged alloy body is designed in a way to give the bike a new level of stiffness and strength just as the other bike stems do. The stem offers improved biking experiences at an affordable and inexpensive price. This is when compared to the different kinds of stems. The Stylo T20 also has a 4-bolt handlebar clamp and 2-bolt steerer clamp which is built or preferably designed to have a flip-flop design that allows you to dial and roll with the position that makes you feel comfortable. The clamped handlebars came first and were input on the first AKA stem. Surprisingly, it performs and does what it’s supposed to do. The cut-outs mean that it’s easy for you to see the reference marks on the bars which make them an ideal brand X straight bars. The finish of the stem makes the bike just fit in precisely with the selected bike. As compared to other bikes and features, this has been so far the lightest and the most workable for most people regardless of the weight. It’s an all mountain bicycle stem which means that you can use it regardless of the kind of area or terrain that you plan to ride. The versatility of the stem makes it ideal for cross-country biking, trailing as well any other outdoor activities that could need the bike input. This stem gives you the ability to ride in comfort with a more upright handlebar position. The design used in this version of the Ritchey Comp Stem aims at having a 30-degree rise angle for higher as well as back-friendly handlebar placement. The 30-Net forged alloy used in the construction makes it possible for you to have great strength without weighing down your bike. On the other hand, you find that the 4bolt face plate makes sure handlebars stay in that upright manner for your convenience. These parts are often considered as your value line given that they are built for your comfortability. Going for the Ritchey Comp products ensures that you get high-level of design sophistication and features that go into these and all Ritchey products. The design of these products will go a long way in ensuring that the job gets done without compromise. It will encompass the very needs of a full spectrum from elite competitors to among others recreational riders, the Ritchey services ensure that they invest their time and resources in ensuring that they deliver nothing but the best for you. 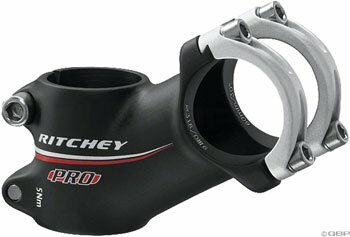 As technology advance, the products in the Ritchey line also advance which means that they keep building and developing newer items to serve you and deliver great performance and value. Made from super high-grade alloys the 30 shapes and precision machining of stainless hardware the Ritchey Stem team ensure that they use only high-quality materials for each application to deliver the most performance from each product. For most fans of biking, the trails we venture into are sometimes dangerous or too rough to partake without accessories that assure you of personal safety. We are also used to trying out new tricks without regard for our own safety which is very bad considering you could get hurt or injured when your bike falls on bad grounds. Testing the limits is allowed but as long as you’ve got some safety measures put in place to prevent bad falls or collisions from destroying your bike totally and leaving you with scars or bruise marks. As an example, some trails could be too steep or sloppy in such a way even the brakes cannot bring you to a complete halt but only slows you down to a safer level. This is the reason bike stems are there and add to the actual support you gain from your bike. With this in mind, you will be more acrobatic and do better stunts than you’ve ever thought possible. We have seen that these stems are an important safety feature not only for the bike but the rider as well. Moving through weird landscapes is often abound to bring tricky bits of the road you haven’t gotten used to. In such moments, falling and getting hurt becomes a very real possibility unless you are able to maneuver out of the tricky areas and get to safer locations. The bike stems detailed above have easy installation features not forgetting a strong, firm build that will get you through anywhere. As a rider, there’s always the need to be better than you were previously and when you have a stem to hold the front of the bike securely as you move about the playing field, you will be able to actually perform better and get to know better tricks with confidence and agility. These bike stems are ideal for upgrading any bike and as a biker, you will feel the difference as soon as you venture off into the hills. In conclusion, it is crucial for you to ensure that you consider the model of your bike before getting to the mountain bike stem purchase. Ensure that you use the bike to help you determine the ideal stem. By so doing, you find that it is possible for you to get the stem that correctly fits in your bike. In addition to this, it is crucial for you to contact your bike specialist so that he or she can help you ascertain the best mountain bike stem for it. Not only will this save you time but also resources as you do not have to spend a lot of time in your selection. Finally, it is advisable for you to go for what you love.